As originally reported by Rebecca Robledo, in Pool and Spa News, this article discusses the issues surrounding electrical safety in and around pools. It wasn’t a high-voltage light that killed a Florida child. Electrical professionals don’t think they’re the problem, but point to various poor practices that can place swimmers at risk. Credit (clockwise from left): Paolo Benedetti; Paolo Benedetti; Alan Brotz It is the opinion of electrical experts who specialize in pools and spas that it shouldn’t take more regulation to prevent electrical incidents like those that have appeared in the media. Rather, they say, the emphasis should be placed on better observation of the codes already in place. 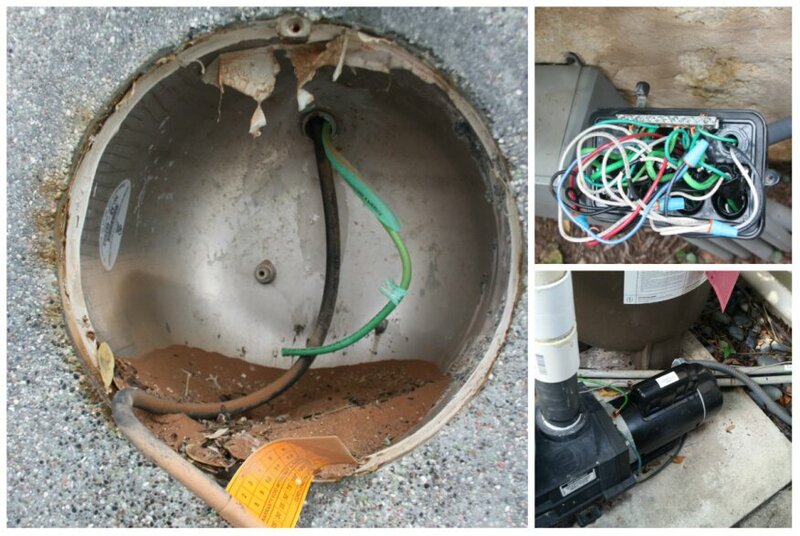 The trouble doesn’t just stem from lights, they add, but also from improperly installed junction boxes, wrongly wired equipment and even failure to bond seemingly unrelated metallic elements around the pool. One issue should be put to rest immediately, lest it cause distraction: It was not a high-voltage light that caused the death of Chris Sloan’s son. Nor does the father make that claim. On April 13, 2014, 7-year-old Calder Sloan, a deft swimmer and intense liver of life, was in his Miami backyard pool when stray current entered and caused his electrocution. The tragedy made international headlines, even garnering a viral social-media campaign in which people — including some celebrities — posed with a self-portrait Calder had drawn, labeled with his nickname, “Mr. Awesome.” A massive version of the portrait was even beamed on the Times Square JumboTron and the Miami Heat’s American Airlines Arena. In their advocacy of electrical safety, the Sloans achieved quick success when their own Miami/Dade County and neighboring Broward banned the installation of lights other than those classified as low-voltage according to the National Electrical Code. But with these victories and the media coverage surrounding it, Chris Sloan became pigeonholed as an advocate of low-voltage lighting in pools and spas. Media misinterpretation and even an interview misstep by one of his own allies portrayed him as claiming that Calder would be alive if his pool had had a low-voltage light. Various stories behind the incident’s cause have circulated around the Sunshine State, so when discussing the possibility of high-voltage-light bans, many first want to know if the more traditional technology led to the incident. If not, they figure, why is the father trying to impose this change on everybody? In fact, the pool had low-voltage lighting — which did not produce the fatal current. “All I can say is there was an electrical short in our house, on our property,” says Sloan, who must choose his words carefully due to pending litigation. “And … the fail-safes and protections failed.” The lawsuit alleges fault in the bonding, grounding and lighting design. Since lights and pumps were first introduced to pools, electrocution has been an issue. Some claim it is the second-highest cause of death in pools and spas, after drowning. But as with so many things, reliable statistics are not available. The Consumer Product Safety Commission reports 14 such fatalities between 2002 and 2009. However, the accounts of some incidents are somewhat unspecific or based on hearsay. A portion of the fatalities resulted from wires or energized electrical devices falling or being dropped in the vessel. This leads some to believe that the true incidence of deaths caused by faulty electrical systems is likely lower. On the other hand, some suspect these occurrences go under-reported: As with suction-entrapment fatalities, death certificates often list the cause as drowning without specifying electrocution, and incident reports often are incomplete. But, especially for those such as Sloan who have suffered a loss due to pool and spa electrocution, the point is that these deaths seem avoidable. In their argument against high-voltage light bans, industry advocates have said the issue expands past high- vs. low-voltage. A true examination of electrical safety merits a holistic approach, they say, one that accounts not only for safeguards surrounding the vessel, but those around the home as well, because current can travel to the pool from outside its immediate area. On this, Sloan and the industry see eye to eye. In this article, industry and electrical professionals discuss whether high-voltage illumination should be banned from pools and spas, where problems exist, and what can be done to further safeguard installations. Pool and spa lights make an easy culprit because they are immersed in the water. Though the National Electrical Code has instituted numerous safeguards to prevent 120-volt incandescents from emitting current into water, low-voltage lights have long been considered another safety measure. For this technology, 120 volts flow from the main power source to a low-voltage transformer, where the power is “stepped down” to the lower levels. But low-voltage lights don’t come with a guarantee of safety or operate in a vacuum. They are not foolproof. Like any electrical component, they require correct installation, with the appropriate transformer and wiring, as well as bonding and grounding if they sit in a metal niche. Without this care, more than the 12 volts can get through the system and, should a short occur, into the water. Just as important, an improperly wired low-voltage system still can function as a path for stray current generated from another source: As it seeks to complete the circuit, the current could travel through the grounding wire, for instance, to water. By the same token, many industry professionals reiterate Brotz’s statement that 120-volt lights are safe if installed correctly, with the appropriate components, bonding and grounding. For this reason, they believe code should not ban high-voltage lights. So far, the committee that writes the National Electrical Code has agreed. “This technical committee feels that with the voltage limitation 150 volts, and with all the other requirements such as ground fault circuit interrupters, third-party testing and listing [of certain components], that these result in safe installations,” says Gil Moniz, a senior electrical specialist with the National Fire Protection Association, the organization that writes the NEC. Those in favor of banning high-voltage lights are uncomfortable relying on the installer’s acumen and safeguards such as ground fault circuit interrupters. “GFI circuit breakers can fail,” says Irv Chazen, Builder’s Committee chairman and government liaison for the Associated Swimming Pool Industries of Florida. But some observers believe the question supersedes data. If low-voltage lighting will reduce the chances of electrocution, they ask, then why not require it? Mike Holt, a nationally known consultant and instructor on electrical systems, is building a pool in his own Florida backyard. When he saw the contractors creating niches in the shell, he immediately informed them there would be no underwater lighting. But, of course, underwater lighting addresses other safety issues, such as the ability to distinguish plane changes in the shell or detect someone in distress. To address those concerns, Holt considers low-voltage lighting the best option. It’s a matter of personal choice for him. “If I were going to do lighting, it would be 12-volt, but it doesn’t have to be [in the] code,” he says. Truth be told, this debate may time out within a decade or less, in part because of the energy-efficiency movement. LED lights powered through solid-state technology usually operate more efficiently than incandescents, plus they incorporate fun features such as programmed color changing, so they may dominate the market in the next decade, Hamilton predicts. Additionally, some products entering the market — high and low voltage — incorporate new barriers to stray current, such as all-plastic niches or hermetically sealed single assemblies. Some of the low-voltage versions don’t require a grounding wire, eliminating another avenue for current to travel into the water. Individuals on both sides of the lighting argument agree that increasing electrical safety in pools and spas extends past the niche. “There are lots of different places where line voltage could get into the water, and just focusing on the light is not going to solve all those other issues,” Brotz says. There is only so much that can be accomplished through code. Like most, the NEC only governs new installation, not maintenance. In Hamilton’s observations inspecting pool and spa electrical systems, the light itself was rarely the problem. Instead, he’s found incidents related to inadequate, damaged or absent bonding in concrete pools, as well as concurrent sources of stray current related to the wiring in other premises. “It’s generally a problem somewhere else that creates the current on the ground wire, and a nonexistent or deficient bonding system that lets it get into the pool water,” he says. Bonding and grounding are the most important safeguards against electrocution in pools and spas. But some professionals don’t know the difference between these processes. Contractors who believe they are the same thing may only install one. Grounding protects people against a possible fault in the system by electrically attaching equipment to earth ground, which is at the lowest “electrical potential,” referred to as 0 Volt potential. If there’s a fault, or short, the circuit breaker should trip and turn off the equipment. To ground a piece of equipment, installers run a properly sized wire from the equipment, through the same conduit as the current-carrying conductors and to the circuit breaker panel. Finally, the wire attaches to the ground bus bar in the circuit breaker panel, which itself is connected to earth ground through a combination of ground rods, cold water pipes, building foundation steel, etc. To bond a component means to electrically tie it with all specified elements, such as the pump, motor, ladder and even the water, to create a “bonding grid,” and minimize the difference in voltage from component to component. (Voltage also is referred to as potential.) If one piece of equipment becomes energized from a fault in the system, then there is a difference in potential from one element to the other, causing current from the more energized component to seek a path to the less energized component, in order to equalize. If a person steps in the way, he or she could become that path, or conductor. A bonding system includes a No. 8 wire that runs from one element to the next, connecting to each on an often manufacturer-provided bonding lug. The wire also should attach to the pool steel in at least 4 locations and to a perimeter bonding ring under the deck, or to reinforcing steel in the deck, and to all permanently attached metallic objects within 5 feet of the pool’s edge. The wire runs through the earth, not always inside a conduit. Installing these systems requires the use of proper components, from wires to connectors, and the ability to adapt to different settings and equipment brands. 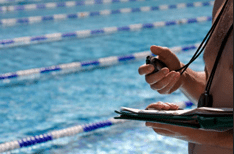 Observers such as Brotz believe these skills are in all too short supply in the pool and spa field. If the solution rests with government mandates, it’s in ensuring the qualifications of those who work on pool and spa electrical systems, he says. In states such as his (Florida), code requires that licensed electricians perform the initial installation of a pool or spa’s electrical system. However, those who perform repairs and replacements go unaddressed. Brotz sees mis-installed lights, but has witnessed hundreds, or even thousands, of cases where pumps, heat pumps, wires and other components were installed incorrectly. The opportunity for error comes with the installation and the repair/replacement of lights and equipment. “I have come to the point where I strongly believe there needs to be an electrical certification class for pool people who touch electrical work,” he says. A task such as changing a motor may seem simple; however, grounding and bonding wires must be installed correctly, with the right connectors. Mistakes that electrical professionals see in the field range from the clearly wrong to the more off-base. But even seemingly small misses can create an opening for current to escape its assigned channels. Properly installing these systems requires an in-depth knowledge of wire types and sizes, connectors, transformers and junction boxes. The water and mostly outdoor locations create their own challenges, which often must be met by special components. Some of the obvious errors could have been performed by homeowners, their friends or handymen, or inexperienced professionals. A prime example of this can be found in the alteration of lights. insides of the light were removed and replaced with ballast transformers and mercury vapor lamps. “When you put a ballast in a mercury vapor light, you’re looking at well in excess of 120 volts or even 150 volts,” he says. It seems the goal was increased brightness; however, the alteration flew in the face of the NEC, not only because the voltage exceeded the 150-volt limit, but also because it involved components not listed for use with the lights. Other alterations may come in the form of inappropriate splicing. The NEC prohibits splicing of underwater wire connections, so pool and spa lights must be powered by a continuous cord, generally the 50-, 100- or 150-foot one supplied by the manufacturer and sealed to the back of the fixture. To replace a light, therefore, the technician must remove the entire cord and pull the new one in place, a process that can become frustrating when the line gets stuck. To work around this, some installers drain the pool below the light niche, cut the existing cord and strip wires back so they can splice in wires from the new light. They’ll then wrap the wires with tape or dip them in epoxy, believing they’ve provided a watertight connection. “They’ve created an immense hazard for the homeowner,” Brotz says. More common mistakes involve the choice of components. For instance, connectors, transformers and other parts of a pool or spa electrical system must be corrosion-resistant to withstand the chemicals and other pool- and spa-related substances that can leach into the soil or hover in the air around pumps, chlorinators and other equipment. Because of this pervasive problem, the upcoming 2017 NEC Article 680, currently undergoing an update, likely will require that appropriate connectors be listed for use in corrosive environments and that manufacturers disclose the materials from which they are made. To help mitigate the most common homeowner error — failing to perform GFCI tests once a month — new, self-testing GFCI receptacles are entering the market. If they pass, they will automatically reset. Misunderstandings also occur regarding the selection of transformers and junction boxes. While the NEC specifies junction boxes should be listed for pool or spa use by a third-party testing agency, some local jurisdictions don’t. It’s generally safer to follow the NEC here, Hamilton says. In addition, low-voltage lights require a transformer or power supply listed for that application. These must have a grounded isolation barrier for the high-voltage winding or must be double-insulated. An incorrect transformer for low-voltage lighting increases the hazard of sending 120 volts to the pool light in the case of a failure. The same holds true for pool and spa controllers. In some cases, seemingly minor steps are overlooked during the installation or replacement of constituents in an electrical system. One of the most common examples of this occurs during the replacement of pumps and other equipment, when technicians sometimes fail to connect bonding or grounding wires that are already present and attached to the original equipment. If the item doesn’t come with a bonding lug, for instance, or if the new bonding lug looks different than the one on the original equipment, the technician may assume it isn’t necessary and not attach it. In other cases, multiple bonding wires are present, with only one bonding lug on the equipment. Some installers then attach just one wire and leave the others loose, figuring that a pump, for example, only needs one bonding wire. However, these extra wires connect to something on the other side, likely another piece of equipment in the bonding grid, and are intended to attach to the component being replaced to ensure all appropriate components are included in the grid. Liquid-tight conduit and connectors also may seem like minor parts and often are missing or not connected correctly. These tube-like jackets and their connectors serve as a barrier from surrounding moisture and protect wires from rubbing against edges on equipment, transformers, junction boxes and other components with corners. When wires enter a transformer, for instance, they should not simply be strung through the opening. Instead, they should be placed in liquid-tight connectors so the edges of the opening can’t rub against the wire and wear away the insulation. If these wires became exposed, they could electrify items that contact it, including metal doors of the housings. Pumps are supposed to have a liquid-tight connector screwed into the back of the motor, with a liquid-tight conduit connecting to it. Often, when pumps and motors are replaced, these items go missing, perhaps when the original is damaged and the technician doesn’t have a replacement on hand. If the pump is bonded and grounded properly, that minimizes the hazard because the breaker will trip; however, this safeguard should be done observed. Certain components, such as low-voltage transformers and electrical panels for control systems, combine low- and high-voltage wiring, which are meant to remain separate from each other. That is why these housings contain individual compartments. But some professionals cross wires or even run them in the same conduit or enclosure, creating a serious hazard: If a high-voltage conductor were to become hot enough to melt the insulation of a low-voltage wire, then the bare wires could touch, causing high voltage to transfer into wires intended to send low voltage. High voltage then could be sent to the low-voltage light. Twelve-volt wiring and 120-volt wiring should never occupy the same space, with one exception: inside the enclosure where the low voltage is created. low-voltage wiring. Here again, they each have their place: Low-voltage wiring must reside on the low-voltage side of the transformer and vice versa. To get this backward is to send potentially hundreds of volts to the lights. Oftentimes, this mishap will damage the transformer due to a blown thermal fuse, so the high voltage never reaches the light; however, caution would dictate that it be done correctly.